Today we are excited to announce the public preview of Azure Time Series Insights, a fully managed analytics, storage, and visualization service that makes it incredibly simple to interactively and instantly explore and analyze billions of events from sources such as Internet of Things. Time Series Insights gives you a near real time global view of your data across various event sources and lets you quickly validate IoT solutions and avoid costly downtime of mission-critical devices. It helps you discover hidden trends, spot anomalies, conduct root-cause analysis in near real-time, all without writing a single line of code through its simple and intuitive user experience. Additionally, it provides rich API’s to enable you to integrate its powerful capabilities in your own existing workflow or application. Today more than ever, with increasing connected devices and massive advances in the collection of data, businesses are struggling to quickly derive insights from the sheer volume of data generated from geographically dispersed devices and solutions. In addition to the massive scale, there is also a growing need for deriving insights from the millions of events being generated in near real time. Any delay in insights can cause significant downtime and business impact. Additionally, the need to correlate data from a variety of different sensors is paramount to debug and optimize business processes and workflows. Reducing the time and expertise required for this is essential for businesses to gain a competitive edge and optimize their operations. Azure Time Series Insights solves these and many more challenges for your IoT solutions. Customers from diverse industry sectors like automotive, windfarms, elevators, smart buildings, manufacturing, etc. 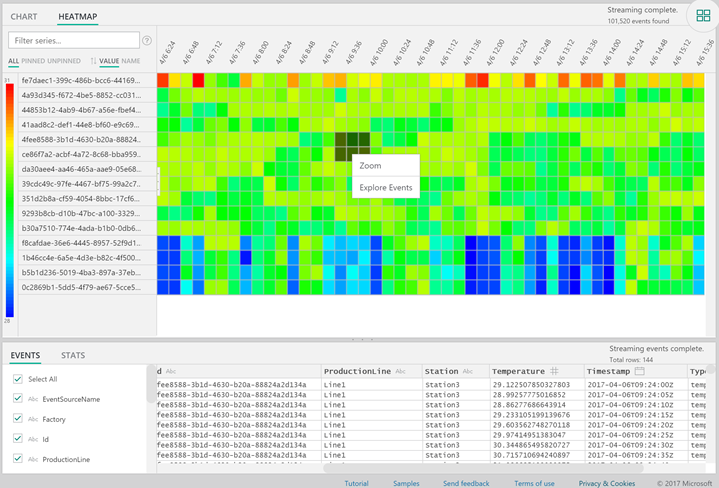 have been using Time Series Insights during its private preview. They have validated its capabilities with real production data load, already realized the benefits, and are looking for ways to cut costs and improve operations. For example, BMW uses Azure Time Series Insights and companion Azure IoT services for predictive maintenance across several of their departments. Time Series Insights and other Azure IoT services have helped companies like BMW improve operational efficiency by reducing SLAs for validating connected device installation, in some cases realizing a reduction in time from several months to as little as thirty minutes. Azure Time Series Insights enables you to ingest 100’s of millions of sensor events per day, and makes new data available to query for insights within 1 minute. It also enables you to retain this data for months. Time Series Insights is optimized to enable you to query over this combination of near real-time and historic TB’s of data in seconds. It does not pre-aggregate data, but stores the raw events, and delivers the power of doing all aggregations instantly over this massive scale. Additionally, it also enables you to upload reference data to augment or enrich your incoming sensor data. 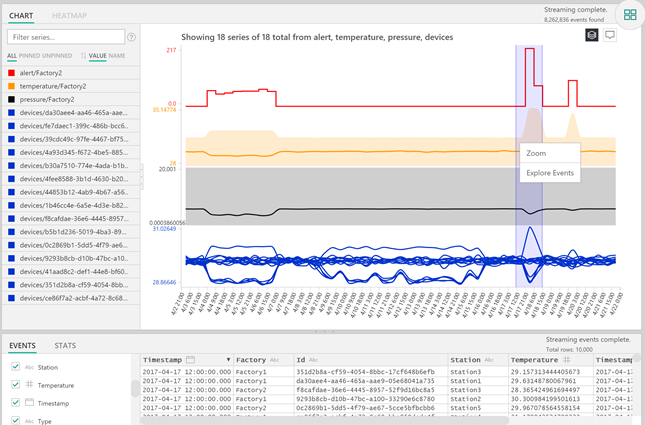 Time Series Insights enables you to compare data across various sensors of different kinds, event sources, regions and IoT installations in the same query. This is what enables you to get a global view of your data, lets you quickly validate, monitor, discover trends, spot anomalies, and conduct root cause analysis in near real time. “Azure Time Series Insights has standardized our method of accessing devices’ telemetry in real time without any development effort. Time to detect and diagnose a problem has dropped from days to minutes. With just a few clicks we can visualize the end-to-end device data flow, helping us identify and address customer and market needs,” said Scott Tillman, Software Engineer, ThyssenKrupp Elevator. With built-in integration to Azure IoT Hub and Azure Event Hubs, customers can get started with Time Series Insights in minutes. Just enter your IoT Hub or Event Hub configuration information through the Azure Portal, and Time Series Insights connects and starts pulling and storing real-time data from it within a minute. This service is schema adaptive, which means that you do not have to do any data preparation to start deriving insights. This enables you to explore, compare, and correlate a variety of sensors seamlessly. It provides a very intuitive user experience that enables you to view, explore, and drill down into various granularities of data, down to specific events. It also provides SQL-like filters and aggregates, ability to construct, visualize, compare, and overlay various time series patterns, heat maps, and the ability to save and share queries. This is what enables you to get started, and glean insights from your data using Azure Time Series Insights in minutes. You can also unleash the power of Time Series Insights using the REST query APIs to create custom solutions. Additionally, Time Series Insights is used to power the time series analytics experiences in Microsoft IoT Central and Azure IoT Suite connected factory preconfigured solutions. Time Series Insights is powered by Azure Platform and provides enterprise scale, reliability, Azure Active Directory integration, and operational security. Azure Time Series Insights extends the broad portfolio of Azure IoT services, such as Azure IoT Hub, Azure Stream Analytics, Azure Machine Learning and various other services to help customers unlock deep insights from their IoT solution. Currently, Time Series Insight is available in US West, US East, EU West, and EU North regions. Learn more about Azure Time Series Insights and sign up for the Azure Time Series Insights preview today.